On the Friday before the Rowingbike Championships, I visited Bram and Ronald at M5 Ligfietsen (M5 Recumbents) in Middelburg. The M5 headquarters is in a beautiful building with a large display area out front. Many of their legendary designs are either hanging on the wall or standing on display tables. 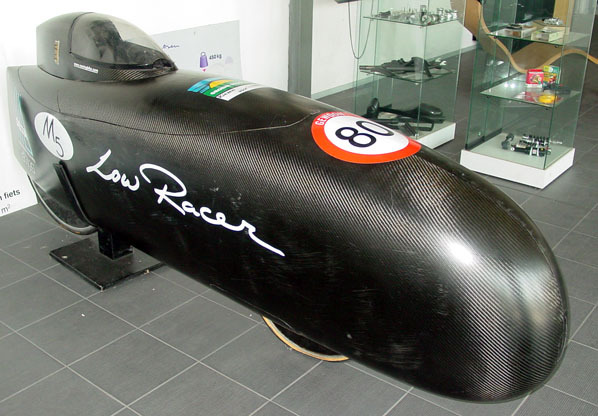 Below is the M5 Carbon Low Racer, owner of 8 world records. Details of these records are found here. Below is a fully faired Low Racer. 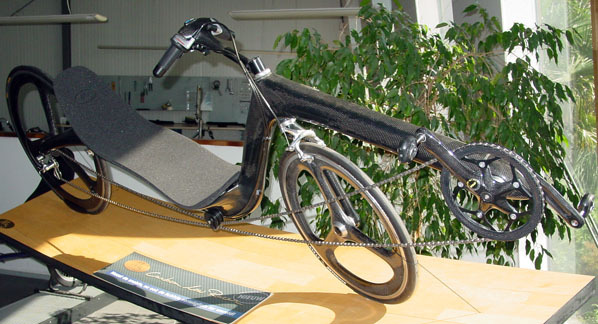 Also on display was this carbon tandem called the Double D. Bram Moens and Björn Frank rode this bike 52.3 km in one hour at the 2004 Cycle Vision and World Championships event in Lelystad, the Netherlands. M5 also produces bicycle components for recumbents and conventional bikes. These M5 brakes are CNC cut from 7075-T6 aluminium. 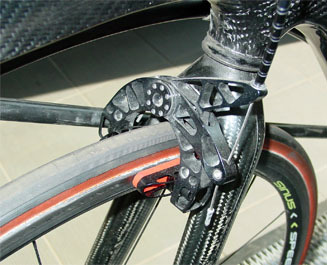 Without brake shoes, they weigh 72 grams. The hubs are also very innovative. 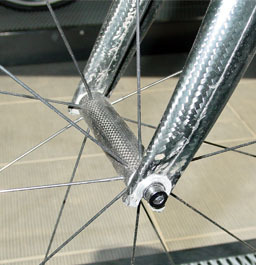 By using straight pull spokes, they have entirely done away with the flange. I was so impressed with everything I saw at M5 that I arranged to bring back one of their used Cromoly Low Racers for the Bicycle Forest rental collection. You can try it yourself here. Thanks to Ronald for meeting up with me Sunday night to box up the bike. It made it home safe and sound! You are currently browsing the Bicycle Forest Blog weblog archives for September, 2006.